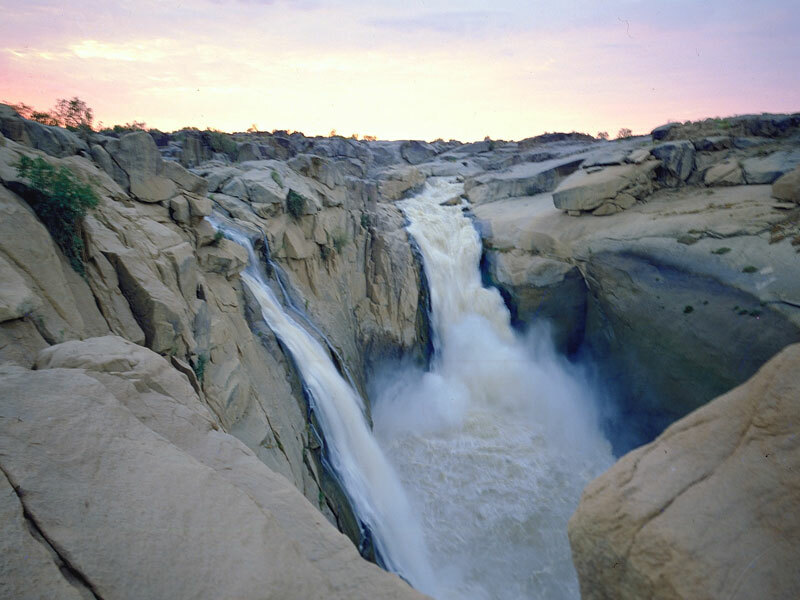 Years ago the KhoiSan called this place in the northern reaches of the Northern Cape ~ Aukoerebis ~ place of great noise. Today visitors describe it as ‘a scene right out of BBC’s Planet Earth‘. The sound of a river in flood as 405 million litres of water plunge over the side of the gorge, every minute, in a rush of sound is every bit as loud as its name would indicate. 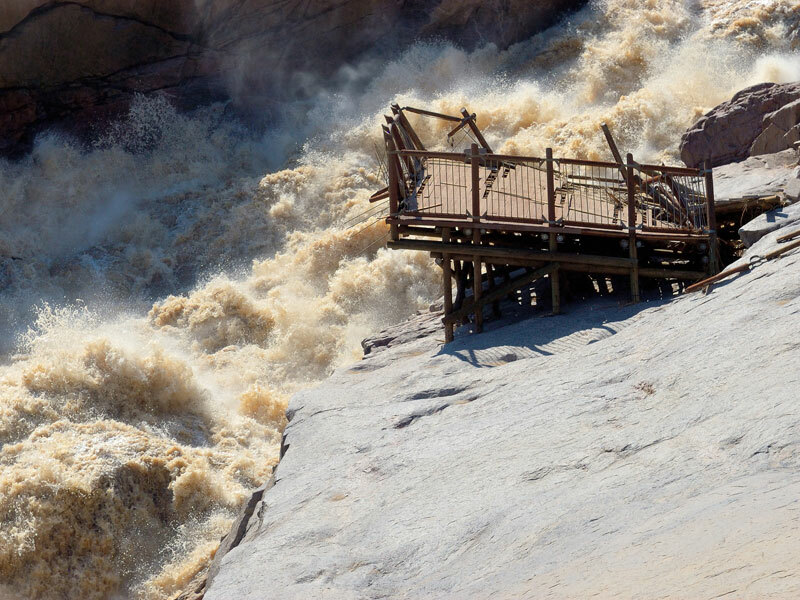 The almost otherworldly desert setting, the consistent sweep of boulders and rocks and the turbulence of the falls combine to form a type of unusual beauty that is at once harsh and striking. Its desert/riverine ecosystem is the most interesting aspect of the national park, that and its 500 million year-old ravine. In full flood the majesty of 19 (minor) waterfalls combine into a torrential boom as the water hits the gorge 56 metres later. As far as waterfalls go, it’s the best you’ll find in South Africa. You might want to exercise caution, however, when viewing. There are tales of those who have leaned over too far in their enthusiasm, sliding with little effort into the crashing turbulence below. But don’t worry, the large fence behind which one views the falls is enough to prevent any mishap today. The huge gneiss (pronounced nice) dome that is Moon Rock is one of the biggest of the large granite domes that are scattered in amongst the landscape. It’s one of the biggest attractions in the park formed millions of years ago, its smooth top the result of layers of rock having peeled away over the years, much like the layers of an onion (have a look and you’ll notice slabs sliding ground-ward). Stand on the top of Moon Rock and you’ll notice it’s not the only granite rock – there are others gleaming away in the distance. One’s prepped to expect flat, desert landscape. But actually the landscape is totally unique with granite outcroppings and gentle hills across the park. The climate of the park is harsh. Only about 107 mm of rain falls here a year, and during summer the temperatures soar easily to 40°C. Go in December and you will find that the swimming pools barely help. Walk towards Arrow Point and you will pass Twin Falls on the way. It’s a far gentler series of one fall, followed just below by a little fall. Combined it makes a beautiful scene. Arrow Point is where the two gorges meet, downstream of the main falls, and a short walk (2.5 km) from the main camp. It is one of the best views back up the gorge into which the main falls drop. The rocks are incredible. Don’t miss this one. Grand Canyon springs to mind (albeit it on a far smaller scale) when standing at Ararat viewpoint (which takes your breath away! ), a couple of kilometres from the main falls. 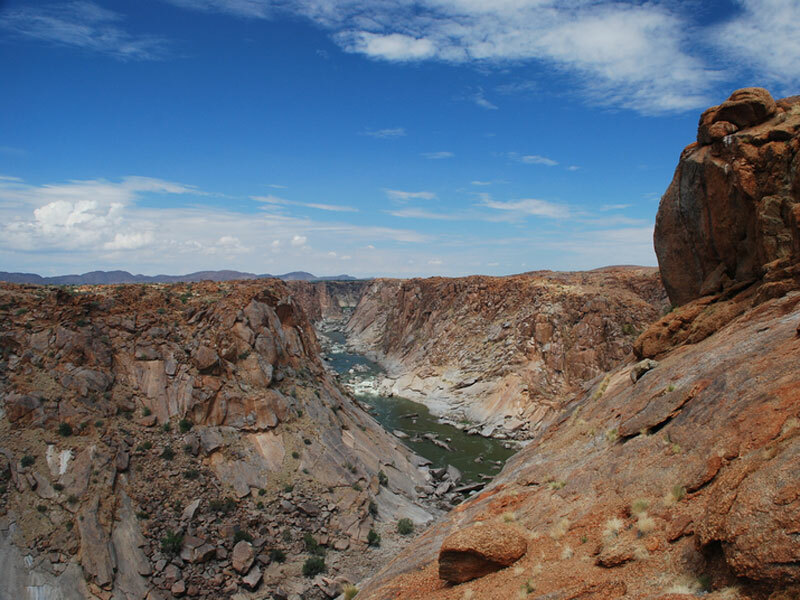 The sweep of the river as it has carved its way through its gorge is beautiful, its erosion, over years, of the granite of the landscape quite incredible. Oranjekom is close to Ararat. The late afternoon light is perfect, even when the falls are a mere trickle. The park is home to 47 mammal species including springbok, gemsbok, kudu, klipspringer, African wild cat, spotted genet, giraffe, aardwolf, leopard and the rare Hartmann’s mountain zebra. Look out too for mongoose, dassie and lizards, particularly around camp. 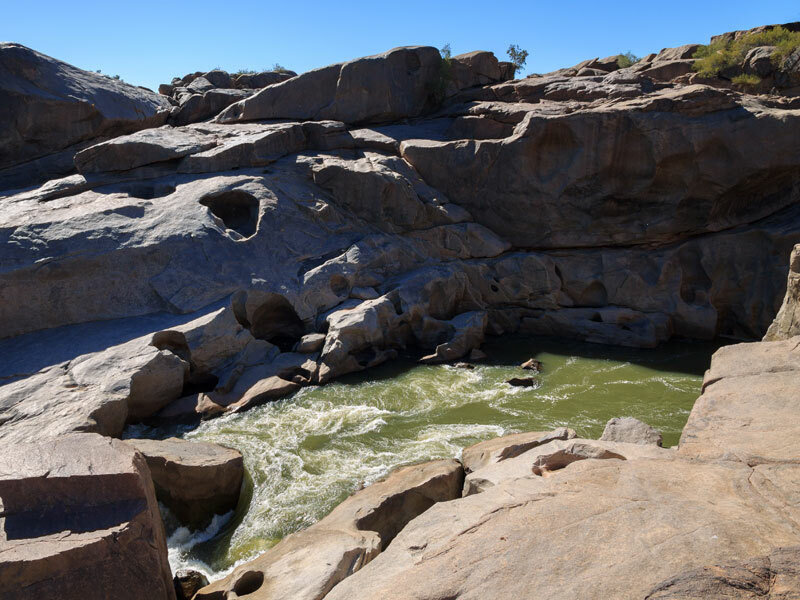 Klipspringer is a three-day, two-night self-guided trail, but you’ll need to book in advance as it’s popular, particularly as it’s closed between October and March because of the heat. Dassie is a lot easier, the circular 6.5 km route taking you from the main camp to Arrow Point before including Moonrock and Potholes. Ebony (a shady walk) and Gorge trails are shorter walks that are good to stretch the legs and take in the views. Also within the Riemvasmaak Conservancy, Tutwa Desert Lodge lies even closer to the border with Namibia than Augrabies Falls National Park. Think of it as an intimate Kalahari retreat because this luxury 16 000 hectare private lodge has only a small number of intimate suites. 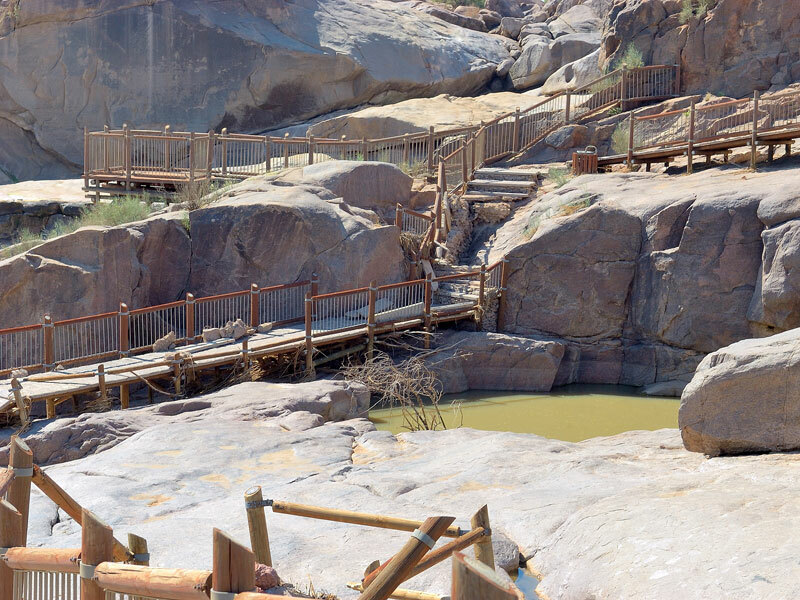 But it also has access to over 20 kilometres of Orange River frontage, and its own leopard protection programme. You won’t want to leave. Not only is Echo Corner a beautiful bit of scenery, but it’s shaped in a way that if you call, your voice echoes back at you. Both sides of the river here are flanked by steep granite cliffs. This is one of the highlights of a stay in the park. 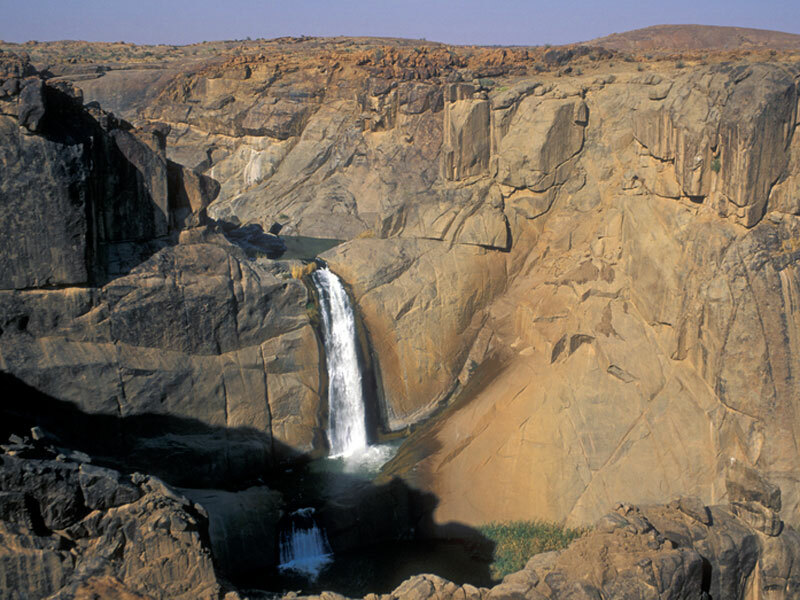 There is plenty of good accommodation in Augrabies and nearby in Upington. If you want to see the falls in full flow (or as close as possible), then between March and May, when the temperatures are a little cooler, is the best time of year. Summer, November to February, can get freakishly hot (42 degrees Celsius in the shade). You can fly into Upington. The park is 120 km west of the town – easily reachable as a day trip.